Discovering new therapies for brain tumors requires cutting edge science as well as properly designed clinical trials. As a member of the CERN Foundation Science Advisory Board, Glenn Lesser, M.D., is focused on ensuring that discoveries made in the lab feasibly translate to the clinic for study with patients. “My role is to ensure clinical trials give us answers when they work and further our knowledge and understanding when they don’t work,” says Dr. 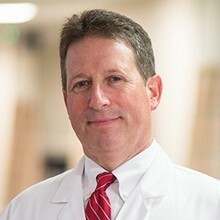 Lesser, a professor and director of Neuro-Oncology clinical research at the Brain Tumor Center of Excellence and the co-leader of the Neuro-Oncology program of the Comprehensive Cancer Center at the Wake Forest Baptist Medical Center in North Carolina. He joined the CERN Foundation board in 2010. Dr. Lesser has focused his nearly 25-year career on being a voice for adult brain tumor patients and a medical neuro-oncology clinical trialist. His work requires foresight, to think about the issues that might arise when bringing a new agent or approach to the clinic, and insight to know how to conduct and interpret the trials. Since the inception of the CERN Foundation, many fundamental advances in ependymoma research have resulted from the support, funding and awareness of the foundation, says Dr. Lesser. Despite increasing laboratory output, there has been little substantial progress in the treatment of most types of adult central nervous system tumors over the last five to 10 years. “We are fundamentally lacking effective therapies for most brain tumor types. But the ‘newer kids on the block’ that may improve our treatment of malignant brain tumors include personalized precision medicine approaches based on genomic analysis of each patient’s tumor, and the role of immunotherapies as part of the treatment regimen,” says Dr. Lesser. Researchers studying the molecular mechanisms of brain tumors growth and development are defining known and novel mutations that could be targets for new drugs. There are also new immunotherapeutic approaches that have been shown to be well-tolerated by brain tumor patients. “This is the evolution of cancer care for all brain tumor types and we are early in the journey,” says Dr. Lesser. For rare brain tumors, like ependymoma, there has been a litany of long-standing problems that prevent researchers from developing new therapies for patients. These challenges, according to Dr. Lesser, include obtaining industry partners interested in developing drugs for niche areas, funding for research, accruing patients with rare cancers for clinical trials, and the uniqueness of brain tumors. Dr. Lesser also notes that the questions that must be answered in designing, evaluating and implementing clinical trials are not always disease-specific. The same issues researchers face in one tumor type can apply to another. “We must always take a 40,000-foot view of any clinical trials program, so we can ensure that those clinical trials translate basic science findings to patients effectively and appropriately across all tumor types,” says Dr. Lesser.